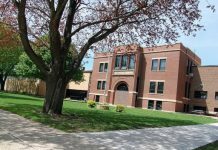 Butterfield-Odin Public High School (B-OHS) recently released its Third Trimester student Honor Rolls for the 2016-2017 school year. A total of 48 students earned recognition on the rolls, 18 on the “A” Honor Roll and 30 on the “B” Honor Roll. Seniors (3) – Heather Pankratz, Brianna Ringen and Krisana Xayaphonesongkham. Juniors (3) – Charlotte Fast, Lukas Pierson and Julie Saunders. Sophomores (4) – Aracely Anaya, Kylie Fisch, Noah Wolle and Kaliana Xayaphonesongkham. Freshmen (5) – Susan Fast, Stephanie Kotten, Jennifer Perez-Ambrocio, Seth Pierson and Vanessa Rodriguez. Seventh-Grade (3) – Mackenzie Christensen, Mahryn Dougherty and Jaelyn Haler. Seniors (4) – Tyler Miller, Bruce Ringham, Victoria San Miguel and Joanna Zuniga Ariaas. Juniors (3) – Edain Archibald, Mercedes Lenning, Abigal McDaniel and Jacklin Oviedo. Sophomores (6) – Leonardo Ambrocio-Sanchez, Jennifer Garcia, Jonathan Hanson, Cody Kaehler, Jordan Keldenich and Michael Nett. Freshmen (7) – Kassandra Hagan, Alexander Hanson, Noah Hanson, Maria Juarez Agustin, Jazmin Molina, Elisabeth Pankratz and Norely Sanchez. Eighth-Grade (1) – Sabrina Hanson and Alma Rodriguez. Seventh-Grade (7) – Raesha Fast, Fabiola Garcia Ambrocio, Valeria Morales, Victoria Navarrete, Maritza Rodriguez, McKenna Steinbrink and Justin Xaysongkham.